A new op-ed piece has been published in Maritime Executive magazine related to STORIS and her disgusting disposal by the Federal Government. It encompasses the recent GSA FOIA response and MARAD's minimal involvement beyond serving as physical custodians of the ship while she was on museum hold. This is discussed within the larger context of ship recycling. As we have discussed, GSA should never have been involved with the disposition of STORIS. Several federal laws have been broken. There needs to be change and there has to be accountability and consequences. I will be posting an extensive response to the piece later. In the meantime, I would encourage STORIS Vets and supporters to pipe up and post how their feelings about what GSA bureaucrats did with the ship, following their ignorance, arrogance and incompetence. They showed no consideration whatsoever for the accomplishments or historical significance of that ship. 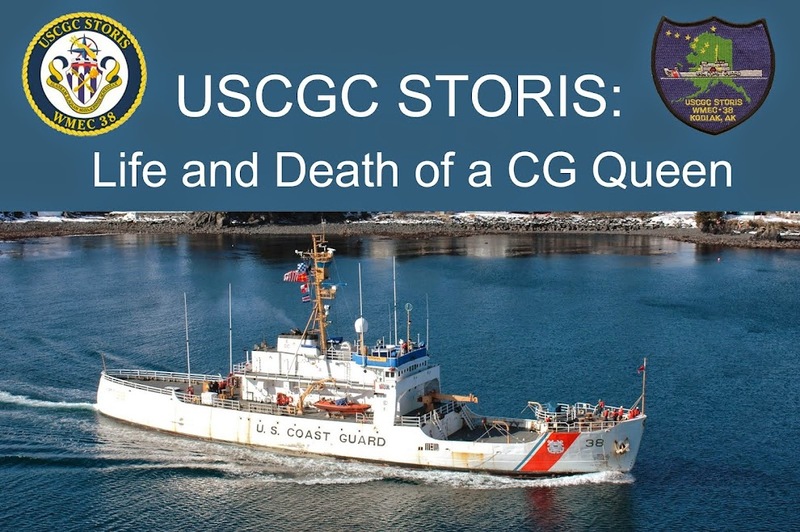 It's an insult to STORIS, her Veterans, to the United States Coast Guard (even though USCG is complicit, too), US Maritime Heritage, and the entire country, considering what that magnificent ship and all of her Veterans did for this country. This is more proof of why we need to support passage of the STORIS Act legislation. Several Vets have sent me letters. Join us. Send me your Zip Code +4 numbers and I'll send you a customized template to send to your legislators. We need to speak up for STORIS. Send me email at cgcstorisqueen@gmail.com. GSA has responded to the appeal of their final FOIA release. This release was posted here on January 27. The FOIA is referred to belonging to Danielle Ivory of the New York Times. This is because this FOIA, as originally assigned through my request, was to have been billed to me at $10,266 to find answers to what happened to STORIS. GSA officials do not believe that the information and circumstances surrounding the illegal sale and illegal export of STORIS are in the public interest. It was only because Ms. Ivory began collecting information related to STORIS and submitted an identical FOIA that GSA waived the outrageous fees. Not surprisingly, as far as the appeal, GSA claims that it has no information related to the points that I made. Same old song and dance. Liars right to the end. GSA officials claim they have no further information related to the source of the funding used to purchase the ship. The buyer, Mark Jurisich of U.S. Metals Recovery of San Diego, recorded online as a “used car dealer” with a suspended California business license, paid $20,000 up front to register to bid on the ship. The buyer did not have the $50,100 balance and he indicated that he was waiting for the rest of the money from “his people” and the remainder had to be paid, he said in correspondence received through FOIA, by using a foreign wire transfer. According to the Bank Secrecy Act of 1970 and the Patriot Act of 2001, the sources of all foreign wire transfers of more than $10,000 have to be reported to the federal government. GSA claims it has no record of the money source, that the funds were transferred directly to the U.S. Treasury. One would think that GSA would alert the Treasury or the buyer to the situation related to the foreign money source, but that would mean following the law. The response also indicates that GSA had no further record of any correspondence between Curt Michanzyk, the obsolete ship sales representative for MARAD and Heather Bischoff of GSA. Michanzyk sent an email on July 2, 2013 asking for details about the sale of STORIS. According to GSA, they won’t discuss details of a sale with anyone but the buyer of a vessel. Hate to break it to GSA, but federal law dictates that the U.S. Maritime Administration is THE agency responsible for disposal of U.S. Government vessels. But ethics don't mean anything to GSA, so why should the law? GSA claims they have no record of how their officials knew the ship was to be scrapped as they do not require the buyer to tell them. Yet Heather Bischoff and Tonya Dillard knew that STORIS was purchased for scrapping. But GSA also states they have no records that indicate STORIS was restricted to domestic scrapping only and that there were no restrictions found that the ship was bound by the International Trade in Arms treaty. This is totally contrary to Section 3502 of the Duncan Hunter National Defense Authorization Act of 2009 which requires that former U.S. Government ships are to be scrapped domestically. This also flies in the face of the correspondence stream that we received that shows the buyer, Jurisich, was in discussion with the State Department because a waiver was required for the ship’s export to Mexico since she was considered a warship by the State Department. That's two federal laws right there in question, but who's counting? A FOIA request to State was denied for expedited fulfillment and it is presumed that that agency is too busy trying to cover and hide FOIAs for the illegal activities of its staff and former Secretary of State Hillary Clinton to respond to my request related to STORIS. They might just follow the company line: "What difference does it make?" GSA’s last point claims that they do not require secure approval from owning agencies in order to accept bids lower than the set reserve. We know now that the secret reserve price for STORIS was $100K. GSA had a bid of $70,100 and Tonya Dillard of GSA sent an email the morning after the auction closed to Jeff Beach, manager of retired boats and cutters to ask if the standing bid was okay to accept from the CG’s perspective. If GSA doesn’t require permission, why did Dillard ask? Why? And where is the response? GSA is wholly dishonest. But no surprise there. The response from GSA then lectures on where the particulars to answer my apparently (in their mind) misguided question are found. Smoke and mirrors, distract and deny. It's the GSA way, the government way. This is the Obama Administration, the most transparent government in history. In short, smokescreen and lies. It’s nothing that we wouldn’t already expect from a corrupt bureaucratic agency. GSA Officials lied from Day One when Jim Loback of the STORIS Museum made contact with GSA in a good faith effort to save STORIS for posterity and preservation. GSA said one thing, did another, and cut corners everywhere possible to get rid of the ship as soon as possible with absolutely no consideration whatsoever for her history and the service and sacrifices she and her crews gave to this country. There is no excuse for what these worthless GSA bureaucrats did, and even for them to claim “they didn’t know” in the case of the export violation, there is no excuse. This is especially true with them shutting MARAD out of the transaction. Additionally, as identified by the DOT Inspector General Report of Dec. 10, 2015, MARAD did not step in for an advisory or regulatory capacity. The process is broken and we lost STORIS as a result. But there is no excuse. Many will agree that the people responsible SHOULD be punished. STORIS is gone, destroyed, thanks to these ignorant, arrogant bureaucrats. The GSA officials responsible for this broke the law. Will anything happen? Hard to say, but one can only hope. We need to speak up and be heard for STORIS. Another year has passed without STORIS as the Queen. While this is an identical post to that of a year ago, it summarizes why this ship was important. STORIS Vets, I salute you. And the Mighty STORIS is not forgotten. If you have photos of the ship from the decomm day or a favorite image to share, please, feel free to post in memory of STORIS. All hail the Queen, the Queen is dead. Some say that raindrops are tears falling from Heaven. When STORIS was decommissioned nine years ago today, there were a lot of tears being shed inside and obviously outside when this image was captured. Congressman Garret Graves (R-LA), emphasizes a point as he asks CG RADM Joseph Vojvodich a question about cooperation between CG and MARAD. USCG Rear Admiral Joseph Vojvodich responds to Rep. Garret Graves' question about the illegal export and scrapping of the USCGC STORIS in Mexico. On the morning of Wednesday, Feb. 3, a hearing was held before the House Transportation and Infrastructure committee Subcommittee on Coast Guard and Maritime Transportation related to the status of acquisition programs for Coast Guard cutters. Speaking before the committee were Rear Admiral Joseph Vojvodich, Assistant Commandant for Acquisition and Chief Acquisition Officer for the Coast Guard; Michele Mackin, Director, Acquisition and Sourcing Management, U.S. Government Accountability Office; and Ronald O’Rourke, Specialist in Naval Affairs, Congressional Research Service. 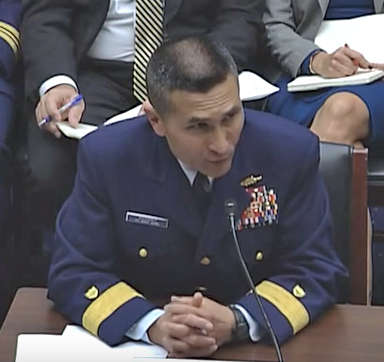 A key focus of this hearing was to discuss how the government – and specifically the Coast Guard – is addressing and moving forward in response to problems that surfaced during the National Security Cutter and Fast Response Cutter acquisition programs. This, even as additional ships from these classes are still being built and new cutters are planned for the Offshore Patrol Cutter program. Other issues such as need and acquisition for Polar Class icebreakers were also discussed. As the hearing approached the one hour mark, Congressman Garret Graves of Louisiana shifted the direction of discussion toward RADM Vojvodich to inquire about cooperation between the Maritime Administration and the Coast Guard. 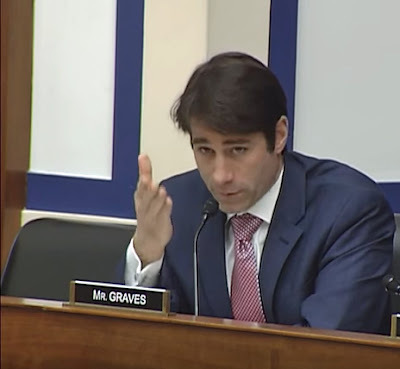 Rep. Graves specifically referred to the DOT Inspector General’s Audit of the MARAD management controls that identified problems in relation to identification and control over disposition of government vessels. This was discussed in the post on this site on Dec. 22. Rep. Graves asked about inventorying efforts between the CG and MARAD to identify cutters slated to be disposed of and scrapped. The admiral responded that he had no specific knowledge of any such disposal list, though he confirmed that CG does work with MARAD. The Congressman asked for elaboration to be submitted for the record related to the activities between the CG and MARAD. Graves then specifically pointed out that STORIS was scrapped in Mexico in violation of US Federal Law. The Congressman then posed the question to the admiral of whether he would state for the record if he was aware of any efforts to address that legal inconsistency with MARAD regarding STORIS. RADM Vojvodich did not have an answer to the specific reference to STORIS but indicated that he would submit a response to Congressman Graves’ question for the record. Based on his delivery, RADM Vojvodich was caught off guard by the question. The hearing then continued on to discuss assessment and acquisition of polar icebreaking assets. 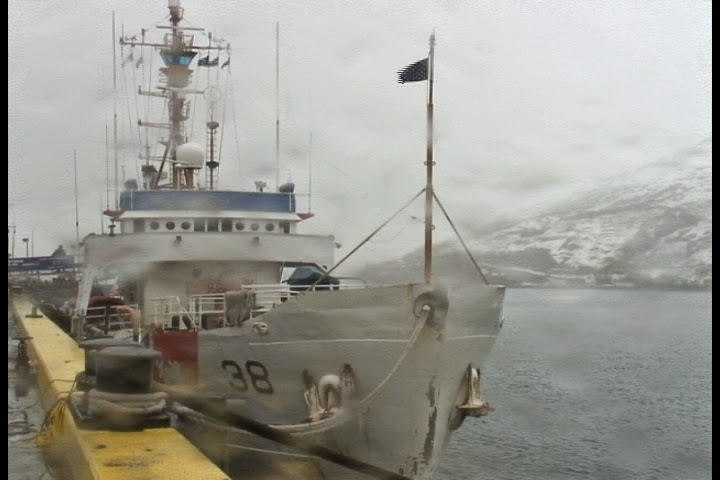 This is a significant development in that a senior officer of the U.S. Coast Guard was officially put on the spot in a Congressional hearing about what happened to STORIS and an answer is required. This is a good step forward in seeking answers for what was allowed to happen to STO. Two facts are worthy of note. One is that RADM Vojvodich served as Executive Officer of STORIS ca 1997-99. https://www.uscg.mil/flag/biography/JosephVojvodich.pdf Now this is nothing personal against RADM Vojvodich, as a couple of STO vets have indicated he was a great guy and he is a STORIS veteran. However, in the greater scheme of things, he is a senior officer that is part of the administration that was complicit in the destruction of the ship. While he may not have had personal involvement or responsibility, he’s a high-ranking officer within the CG Administration. As this whole affair has transpired, the higher you go in the food chain, the level of concern and sympathy for STORIS’ fate becomes inversely proportional to the level of seniority, rank and political position. The other major point to recognize is that Rep. Graves is responsible for introducing HR 2876 in the House. This is the House version of the STORIS Act. 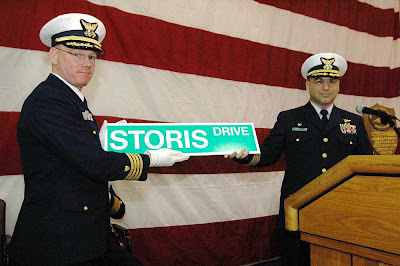 He’s on the ball and brought STORIS to the forefront of a major Coast Guard hearing. Efforts are moving forward to get this legislation passed and it is clearly an active topic of discussion in Washington. There will be more developments coming with this and I will post as soon as I have more to add. In the meantime, I have had four more STORIS Vets indicate to me that they are interested in writing letters on behalf of the ship. I have also just submitted my letters to my Congressional Representatives, as I had been waiting to time it in conjunction with some legislation that they were pushing for. They will be hearing from me by phone as a follow up next week. I am hoping to hear from more STORIS supporters around the country as we work to push this legislation forward. Email me at cgcstorisqueen@gmail.com and I will set you up with a letter template and information for your specific Congressional Delegation. Zip Code +4 numbers will need to be included in the email to identify the correct senators and representatives.